Did you wonder what kind of moth was in the cocoon in the “another lacewing larva” post? I did and so I kept an eye on it. This week a brown moth emerged. 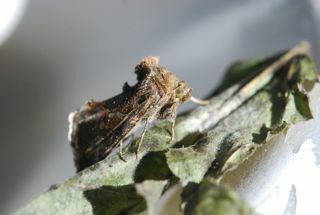 It is a cabbage looper moth, Trichoplusia ni. Check out the punk look. Isn't that wild? I didn't muss this moth up, those are naturally arranged scales. It also has some white markings on it's wing. 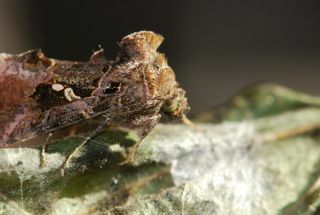 The cabbage looper pupa is pale green with some brown marks on the back and it is hidden under a shield of white silk. The cabbage looper caterpillar was bug of the week in an earlier post. It is a pale green caterpillar that loops when it walks. Moths are often ignored because they are small, drab and are most active at night. But as you can see, if you look at them close up, they can be quite fascinating.